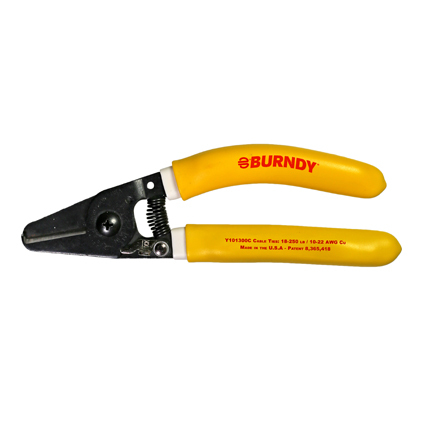 BURNDY® Y10 Stripper/Cutter series of hand tools consists of Y101300C cable tie and wire cutting tool and Y101400SC, which is a wire stripping and cutting tool for use on soft metal wires; copper and aluminum ranging from #22 - #10 AWG. Ergonomically designed, these tools provide custom-designed jaws that eliminate accidental damage to bundles of wire or cables. The high quality heat-treated steel alloy blades provide a crisp cut. Additionally, both tools feature comfort fit, cushioned handles and scissor-action along with auto spring that works with your hand’s national contraction motion, helping to reduce user fatigue. The new BURNDY terminals feature NEMA-standard spacing (1/2″ diameter stud holes spaced 1-3/4″ apart). Two sizes with range taking conductor ports cover from #2 AWG through 750 kcmil, the conductor ports are in a stacked arrangement to save space. Each size offers a configuration to accommodate 2, 3, or 4 conductors. The ACC-F4F is easy to install and slides 90 degrees on to module frames of various thicknesses. The ACC-F4F accommodates 1 to 4 PV cables up to 8.0mm in diameter. The rolled edges are designed to help protect cable insulation from damage. BURNDY Type YDS-RL UNISPLICE single sleeve full tension splices can now be installed with the reliable 644 Series and recently introduced PAT444S Series family of nest and indentor tools. The BURNDY® festoon grounding systems include the tracks, hardware, axles and wheels needed to create a quality, “active” grounding system. With these festoon systems, your valuable conductor is elevated and managed to protect from things like pinch points and theft. BURNDY® offers festoon systems in a variety of lengths and can assist in determining the right fit for your specific needs.